Thank You for taking the time to check out the Essential Life Series 2016! ELS is a collaborative project of Health, Wellness, Mindfulness, and Nature Retreats & Workshops. Click Here to proceed to Program Page. 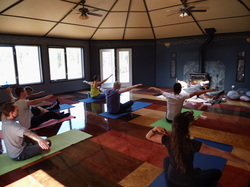 This unique concept has brought together an Inspiring Team of Enthusiastic, Knowledgeable, and Approachable Respect-the-Earth People, in one of the most clean, quiet, and pristine parts of the Canadian Rocky Mountains, in a Cozy Mountain Lodge with brand new beautiful Sacred Gazebo, and atmosphere of comfort and home. ELS is an opportunity for all who participate to gain Experience, Skill, and Knowledge to Powerfully and Consciously Co-Create Life with Loving Professional Support and Guidance!! Receive and Expand in a Safe Inclusive space where we assist You to take great care of You. We assure You, it is an Honor. We are truly grateful to all Parts which create the Whole for their Unique and Diverse Contributions! Who are we, the Essential Life Team? We're a crew who are stoked on life and expansion through experience. We enjoy learning life-lessons and sharing life-skills along the way. We also share a Mega-Priority of being outside in Nature as much as possible. We love to share Life with each other and we'd also love to share Life with YOU! We are excited for the year ahead and it's our intention to Act, Co-Create & Enthuse all year long! . . . and really what we're shooting for here is All Life Long! We invite you to come Act, Co-Create, & Enthuse with us! !